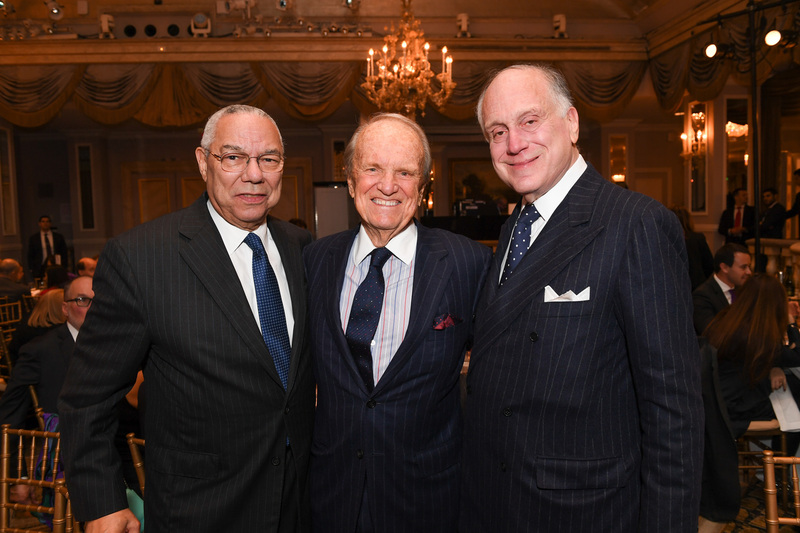 NEW YORK – Former Secretary of State General Colin Powell was honored Wednesday with the World Jewish Congress’ annual Theodor Herzl Award, which recognizes outstanding individuals who work to promote Herzl’s vision of a strong Israel and a safer world for Jews and all people. The WJC also honored legendary film director George Stevens on Wednesday posthumously with the Teddy Kollek Award for the Advancement of Jewish Culture. General Colin Powell served in the US Army for 35 years, rising to the rank of Four-Star General, and went on to hold senior military and diplomatic positions in four presidential administrations: From 1987–1989, Powell served as President Ronald Reagan’s National Security Advisor, and from 1989–1993 served as Chairman of the Joint Chiefs of Staff for both President George H.W. Bush and for President Bill Clinton – the first African American ever to hold this position. Under President George W. Bush, Powell was appointed the 65th Secretary of State. Previous recipients of the Theodor Herzl Award include former US Vice President Joseph Biden, Israeli President Shimon Peres, Elie and Marion Wiesel, former secretaries of state Henry A. Kissinger and George P. Shultz, and, posthumously, Ronald Reagan and Axel Springer. George Stevens, Jr., a noted filmmaker himself, accepted the Teddy Kollek Award on his father’s behalf, and described the experience of traveling to Europe together in 1957 to prepare ‘The Diary of Anne Frank,’ one of the first Hollywood film to deal with the Holocaust. “I know that were my father here today, he would consider himself a voice in the chorus of the World Jewish Congress. He, like you, was determined to preserve the memory of the Holocaust and the millions who died, and he believed at his core in tolerance, human decency and justice. I accept this award with what I know would be George Stevens’ embrace of the noble and urgent goals of the World Jewish Congress. The senior George Stevens is best known for what is often called his ‘American trilogy’ which earned him two Academy Awards – A Place in the Sun (1951), Shane (1953) and Giant (1956), but his work spans comedies, romance, musicals, and drama. During his army service in WWII, Stevens headed combat motion picture photography for General Eisenhower, capturing memorable images of D-Day, the advance through Normandy, the Liberation of Paris, the Battle of the Bulge and the discovery of the concentration camps at Nordhausen and Dachau, and prepared two films as evidence for the war crimes trials at Nuremberg. Goerge Stevens, Jr., himself an Oscar winner, is a producer, director, and playwright and the recipient of 17 Emmys and 2 Peabody Awards. The inaugural Teddy Kollek Award was presented in 2016 to actor Kirk Douglas.